Tito Nieves, an Elegant Evening of Dancing & Great Music! 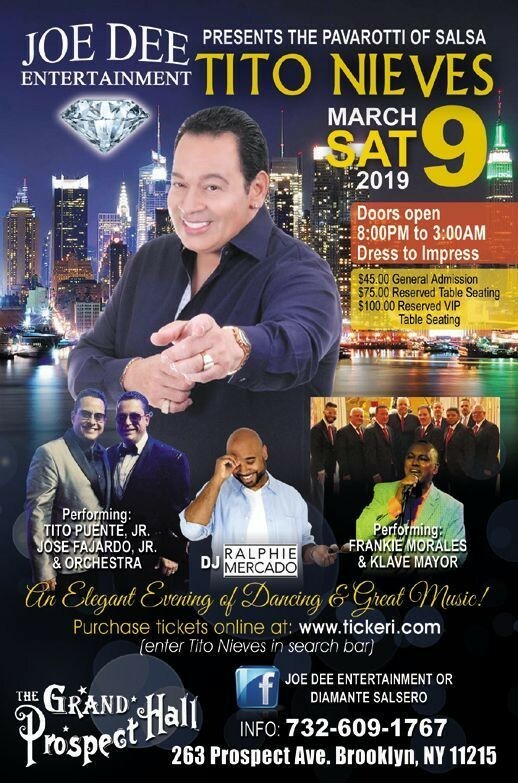 Joe Dee Entertainment presents The Pavarotti of Salsa, Tito Nieves, on Saturday, March 9, 2019 at the beautiful Grand Prospect Hall in Brooklyn, NY. Join us for an elegant evening dancing to Salsa, Bachata, Merengue, Charanga, Disco & more! Also performing, Tito Puente Jr., Jose Fajardo Jr. & Orchestra. Klave Mayor, with special guest singer, Frankie Morales & the legendary DJ, Ralphie Mercado. Also spinning will be DJ Sav! Dance the night away on a spectacular floor! !